Rusty Florist Jakarta Online presents the latest of our services; while this time is at church flower decoration for the wedding marriage blessings holy matrimony event. Where at this event needed decorator services to conjure up the wedding marriage blessing event in the church to be beautifully decorated. On the basic in decorating any venue is the layout of the room itself, and focuses on the main space area, as can be called as main stage as everyone in the room pay attention to it. When on main stage at any various events, it is no exception to the blessing holy matrimony decoration is on the altar itself as the main stage. By looking at location in doing research at first place by recording a description of its location and the room layout, that then making task list in purpose for adjusting the design and its application when decorated session held. At the photo attachment in this article, the main area already has a pretty beautiful background with relics decoration, so the quests for the designer of a wedding organizer is how to decorate it to make it looks elegant without too much effect of colors, with enough shades of white from cream white to broken white for silver looks, which will leave a beautiful memory on documentation of weddings holy matrimony that seem simple but elegant and fresh. In holy matrimony decorations are mostly requested for the desired color shades, mostly shades of white, soft shades of pink along with white, then the gold color shades of the flower as in salem peach color is graded along with derivatives of other color flowers. 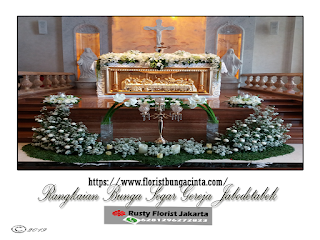 The tips - from Rusty Jakarta Florist, pay attention to the altar; while the main altar is like an open stage: whether you want to use a decorated backdrop of fabric clothes or curtain alike, or use a backdrop of hardware ( that made of from various materials; from wood, gypsum and others), beautifully decorated with flowers. And if the ceiling on the main stage of the ‘altar’ area looks very high, then ask the decoration service provider such as Rusty Florist to make a backdrop that will have the right heights so that it is looks not empty when been done for the documentation photo purpose. And for the altar backdrop length, it depends only on the needs and desires of service users. Because indeed many stages of the church altar are as wide as the stage length of the aisle for the wedding reception in venues or halls. Enough for now, our article in decorating holy matrimony wedding blessings in the church. and or via email: #OrderFlowerDecor@RustyFlorist. Available flower decoration services for Jabodetabek and other provinces with our first confirmation in advanced..